And add a preview of what it was in its glory days. 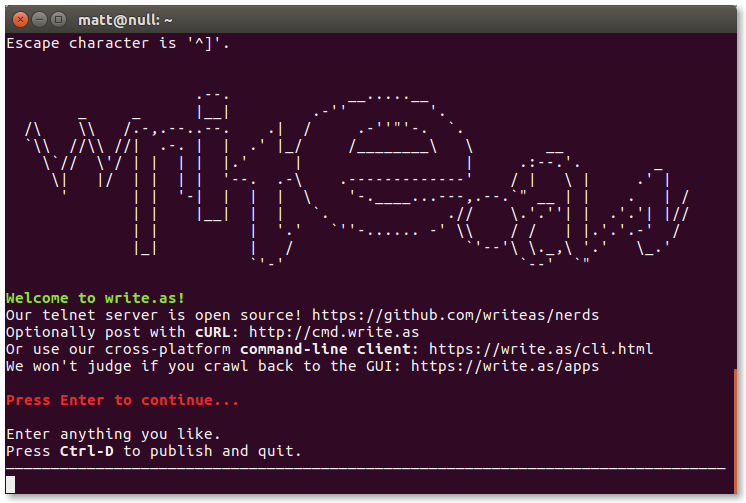 This is a simple telnet-based interface for publishing text. Users connect and paste / type what they want to publish. Upon indicating that they're finished, a link is generated to access their new post on the web. Or not :(. We had to shut it down because it was getting DDoSed too much. But you can still run it yourself. Directory where text files will be stored. Directory where required static files exist (like the banner). Hostname of the server to rsync saved files to. The user's input is simply written to a flat file in a given directory. To provide web access, a web server (sold separately) serves all files in this directory as plain/text. That's it!